This week I did an intervention on Sarah, one of my dearest friends. It wasn't the first time. Over the last few years I have unsuccessfully attempted to get her to seek help for a problem that has cost her conservatively $48,000 and put financial and emotional stress on her family. This week, after over five years of trying to manage her problem, she finally hit rock bottom. She once again had to borrow money from her family — this time to pay for her daughter's healthcare. Sarah had $800 of the $900 doctor bill in the bank, but she'd already earmarked that money for the horrible monkey on her back. Sarah has a substance abuse problem — but not with drugs. Sarah has a problem with self storage. Sarah used to have financial stability. But five years ago she made a major life change when she decided, at age 40, to adopt a child and become a single parent. Sarah sold her beautiful 3000 square foot home so she could afford to quit her high-powered job and be a stay at home mom until her daughter could start pre-school. She moved into a 1200 square foot apartment in a good school district. This was all part of a good, long term plan. Unfortunately, she then made what became possibly the worst financial decision of her entire life: She put the 1800 square feet worth of possessions that didn't fit into the apartment into self storage. Using a technique that drug dealers use to reel in future customers, the storage company offered Sarah, the first time user, free product to ensure her loyalty. Convinced that she would be able to sell, donate or otherwise dispose of her extra stuff during the "First 30 Days Free Rent" period that her storage company offers to all new customers, Sarah moved her designer guest room furniture, her Christmas decorations, her art collection, etc into four of the cheapest storage units available. "I'm just going to use this as a staging area to get organized," she told me at that point in time. "That way, I'll have four weeks to figure stuff out and won't have to make any financial decisions about what to get rid of under duress." Although she has plenty of very valuable things in storage, as we surveyed the contents of one of Sarah's units earlier this week, she finally did the math. Even if she pulled everything out of the unit and set it on fire in the parking lot, it would still be a better financial decision than keeping it in storage for another month. 5 years x $200 a month per unit x 4 units = $48000. And that total doesn't even account for the money spent on gasoline to get her to and from her storage or all the late fees she's paid on other bills because she chose to pay her storage bill on time so her stuff wouldn't be seized for non-payment. The phone company can turn off your service, but the storage company can auction off your dream diary, fake IDs, and herpes medication to the highest bidder. Although Sarah's situation may be the worst that I know of personally, she's hardly alone. According to the Self Storage Association, 50% of storage unit renters are storing what won't fit into their homes. 1 out of every 11 Americans rents storage. Watching Sarah's horrible journey has made me realize that, although self storage (like easy credit), can be beneficial to a percentage of the population, it's a pact with Satan for many folks who don't have an iron fist over their finances or excellent time management skills. Quite simply, it's bad on several fronts. I called four different storage companies with units in my area of Los Angeles. The cheapest price for the smallest storage space, a 5 x 5 unit, in my neighborhood is $67 per month. The first month costs just a mere $1, but that's not counting the one time only $22 "Administration Fee" that they'll also tack onto the first 30 days. Although all those numbers sound doable financially, if I rented this space, I'd be out a whopping $760 in the first 12 months, all to rent a space that's the size of my laundry room. In other words, stuff that isn't functional enough to put in my house and use every day would become more and more expensive with each passing year. Self storage is like diet food for material goods. It fools the mind by fooling the eye. If your clutter isn't visible in your house, do you really have a spending problem? The first self storage facilities were built in Texas in the late 1960's. It took 25 years to build the first one BILLION square feet of storage. But it took just eight years (1998-2005) to add the second billion. According to the National Association of Home Builders, the average 1960's home was 1200 square feet. In 2004 the average home had ballooned to almost twice that size to 2330 square feet. Bigger houses are harder to fill up, which may explain why Americans buy twice the number of consumer goods than the citizens of any other first world nation. (Okay, so we're a geographically huge country, but if we've got such big homes, why do we need an additional billion square feet of storage space?) The environmental cost of creating, transporting and finally housing two billion square feet of unused possessions is mindboggling. Self storage companies count on the basic physics of human laziness, that is: Objects at rest, remain at rest...in storage. After all, who wants to spend their precious free time, digging through boxes looking for stuff? Sarah, in her efforts to deal with her storage problems, has spent hundreds of hours "organizing" her stuff in storage, attempting to repack it more efficiently so she can scale down to smaller, cheaper units. In all fairness, one of the storage companies in my area is housed in the hollowed-out facade of an Art Deco office building, so that's quite pretty. But for the most part, self storage facilities are architectural monsters. In addition to being ugly as sin, they bring in few jobs or sales tax benefits to the community, compared to other structures of similarly huge proportions. There are certain groups of people, like those who live on sail boats and soldiers fighting overseas, or the newly moved, who can follow their dreams because they can temporarily stash their possessions in storage. Storage gives them the wiggle room to experience life without being connected to personal belongings. For more than half the storage renters, however, this is simply not the case. Once a month, one of the storage companies in my neighborhood holds an "estate sale" where the owner of the company sells off the contents of units that were seized for non-payment of rent. What odd, desperate or lazy story is behind this lapse of judgment? Why the renters failed to move their possessions out of storage before the rent was due is always a mystery. What tales of woe are behind the abandoned photograph albums, bronzed baby shoe ashtrays or the hand-embroidered vintage napkins? Why weren't these items, so obviously full of sentimental value, kept in the home where they could be used and admired? A clearer narrative about why items were acquired is visible from a lot of the sale merchandise, however. You can almost hear the nagging spouses behind the half dozen exercise bikes and Thighmasters for sale each month or the siren's call of Martha Stewart behind the hundreds of half-finished craft items. Whether they are nostalgic artifacts from the past or wishful self-help tools for the future, none of these objects relate to the present day lives of their former owners, which is probably why they were put into storage to begin with. These monthly sales are sad museums, a collection of failed ventures and unfulfilled dreams of what could be. As with every successful product, self storage provides a powerful storyline for the consumer to buy into: that preserving memories of the past or the potential of the future through material goods is valuable. For the past five years, Sarah has denied the chaos that keeping so much stuff in storage brings to her daily life. Her dream of returning to her former standard of living in the future has cost her the very security she wants for her daughter and their quality of life today. $48,000 could have gone toward her daughter's college fund. $48,000 could have paid for a lifetime of vacations. It could have been a down payment on a house. Up until this week, I think Sara actually believed that she would one day find her way back into a big house in the hills, even though she's a self-employed, single parent facing a global financial downturn. As I photographed her possessions to list on Craigslist, she fretted about selling her formal dining room set, because she wanted to pass it on to her daughter as a family heirloom. That her daughter, who is currently in kindergarten, might not like the style of the set as an adult and would have no emotional connection to an object that she'd only ever seen in storage, never crossed her mind. I have a friend who moved away to attend medical school and left stuff in a self-storage unit that runs about $100 a month. The quickest he could have gotten back here after finishing his residency would have been five years, I think--which would mean having spent $6000 on storage costs. I have no idea what my friend stored, but there's no doubt in my mind that he'd have been way ahead if he'd sold what was saleable and then given away or thrown away everything else (except a box of stuff like family photos, legal papers, and such small enough that he could have left it with a relative). Instead of a storage unit full of old junk, he'd have had thousands of dollars with which to furnish his new place with whatever seemed best, instead of whatever he'd accumulated during and after college. Every time I think about spending money on self-storage, I first think about whhat that extra $50 would do to my mortgage repayment if put there, or -- even better -- how much more house I could have bought if I had merely been willing to add $50/mo to the mortgage payment I was willing to pay. Then I find a way to sufficiently recycle other things in my home to avoid the need to store. I have to agree that in some cases storage spaces can be very useful, but most of the time they are money pits. I thought about renting a storage space when I moved from a larger apartment to a smaller one, then rethought the situation and decided that storing my goods would just lead me to believe that I needed more things and I would end up wasting more money. I would advise against them generally. Self storage is actually a pretty good deal if instead of storing stuff in it you live in it. I saw a web comedy series about that. I also read a really sad feature story in a newspaper about people that have resorted to it. Most facilities would evict you immediately. It brings up the question - could you actually create such no-frill housing as to be able to charge a nominal fee like $50/month? I think you hit it on the head - for some people, it's a useful tool, but that's not who the storage companies make their money from. My parents have a small storage unit - they live in an RV, but they really wanted to keep a few things (some photo albums, the bedroom set they bought when they got married, some paintings) and my little brother, who lives in another country, asked them to keep some of his childhood stuff and some things he only uses on his annual visit here. But first they sold off most of what they owned on Ebay, gave sentimental pieces to friends and family, and had an estate sale. They have RVer friends who dump a lifetime of possessions on their kids to store, or keep their original houses just to be full of stuff. It's insane - and it's just like your friend, holding onto the past even when you've decided to leave it behind. we used self storage as a tool to clear out our home while it was on the market, and again to store our boat for 6 months during the winter before we added a boat driveway to our new home. I just don't understand storing stuff...but then, I regularly clear stuff out and donate it to Goodwill or hold a garage sale. We have 10 boxes stored in our attic that hold the decorations for different times of year. Otherwise, everything is in use or stored in cabinets in the house. The best use I've ever seen of Self Storage is as a set for the X-files. Some of my favourite episodes involved the unspeakable goings-on within locked storage facilities! Seriously though. Renting a self-storage place to resolve a clutter problem is like curing obesity by buying bigger pants. I briefly considered self-storage before deciding that it would be better to use the monthly cost of self-storage to make a case for getting rid of junk. That was harder than you might think. My wife seemed to have unusually strong attachments to battered Ikea bookshelves that you wouldn't cross the road to spit on if I left them by a dumpster. Our non-profit group recently started storing our event materials in a self-storage unit. Previous to this, people were storing things in their own garages or closets which made it difficult to keep an inventory of all items. And made it almost impossible to track down items once people left or moved from the city. We found a local self-storage that gave us a discount for being a non-profit. Generally I think most people should not be paying for storage. Most of the stuff is junk they could / should do without. So they're likley paying more in storage than the stuff is really worth. However, some temporary use of self storage could be OK. If you're moving or in transition then storage is a reasonable solution. My sister uses self-storage because she is staying with friends to save money and does not plan on her current living situation to be long term. So she will need her stuff once she is living in her own place again. I understand her reasons, but also long for the days when I could move everything I owned in my volkswagon! In September 2008, I began renting a storage unit because I needed a place to stash my stuff while I fulfilled a life long dream of backpacking across Europe. Roughly, six months later, in April 2009, I got a job clear across the continent and moved from Atlanta to Seattle. I kept my belongings in storage in case the move didn't work out and I needed to come back. In September 2009, I visited home and cleared everything out of storage. I gave away most things, and have a few boxes that couldn't be sorted stored in my parents' garage. I kept my storage unit for exactly one year, and I used it for exactly what it should be used for...a place to keep your belongings while you're in transition. Once I settled down, the storage unit had to go. The commercials for self-storage that portray it as a "got too much stuff? Save money by storing them!" solution sicken me. People here are right... if you're not using it as temporary storage while you're moving, you've got too much stuff... use it or sell it if you need the money. I was surprised to see you specifically mention that those who live on a sailboat are an exception. I live on a sailboat and find our 8x10 unit invaluable. We actually use it as our 'warehouse' for our small business, so we're in it nearly every day. We consider it an excellent investment because of this. Anyone else find it ironic? First: I agree we Americans have too much stuff. That said there are deeper issues. For the record I do have a storage unit- see the end of this comment. "It took 25 years to build the first one BILLION square feet of storage. But it took just eight years (1998-2005) to add the second billion." "According to the National Association of Home Builders, the average 1960's home was 1200 square feet. In 2004 the average home had ballooned to almost twice that size to 2330 square feet. Bigger houses are harder to fill up, which may explain why Americans buy twice the number of consumer goods than the citizens of any other first world nation. (Okay, so we're a geographically huge country, but if we've got such big homes, why do we need an additional billion square feet of storage space?)" Another answer is that certain towns/cities and home owners associations now have laws and/or rules against storing certain items or building un-attached outbuildings or altering your existing home to add storage. Sure you might be able to buy a used 10' x 20' shipping container and get it dropped on your property for about $2000-$3000 but the fun will really start when your town cites you for code violations or the HOA says you have to move it or face a lawsuit because it is against the rules. Some other issues: people are just plain dumb/stupid and do not know how to pack/store items in their homes for least amount of space. That same issue follows through to the storage units. I estimate that most people could probably store their same items in 1/2 the size unit they currently have. I know this because I have had to pack out a storage box for myself and also participated in clean outs with people who have purchased defaulted units. It is incredible the empty and unused space in found in the cleanouts- people literally move items into the storage units like they arrange them in their homes. I helped with one in which the people had put the dining room chairs around the dining table as if they were going to eat at it- though they did put about three medium sized boxes on the table top which could have held about 10 of the same size. I do have a 10' x 30"(12.5' x 30 actual) storage unit in a rural area outside of a major Southeastern US city. I pay only $97! per month for this space. I needed to get it when a divorce forced me to move a volume of vintage motorcycles, parts bins, tools, workshop items from my former residence's full basement garage and put myself into an apartment with no storage other than the room closets and no tolerance for unregistered vehicles parked on the property. At my initial move out I actually needed two units for about two months to store and sort the equipment. I knew that it would all fit into one unit but that is what happens when moving but not packing and I got everything into one unit after two months. Having purchased the contents of several, maybe 6, storage units whose 'owners' had not paid their fees I'd like to make some observations. Total cost was $651. First - based on what we've found, if the owners of these units had simply sold off 1/10th of what was in the unit, they would have been able to pay the charges. Second - All of the units had real junk stored - there is no reason to store paint encrusted brushes, broken or pieces missing toys or food (it should be eaten). Third - I don't believe any of these people had any real thought of using, selling, donating, dumping the items they stored. Sort of using a basement/attic for the extra stuff - except it costs them monthly and you have to travel to get there. Some of the items we have found and sold: 2 LR sets, 12 lamps with shades and bulbs, children's toys, set of dishes service for 6 in the box never opened, same for stainless utensils, several 100 candles/candleholders/vases/knick knacks, designer purses including authentic Dior/Coach/Nine West, a dining room set with table/6 chairs/china hutch, really nice costume jewelry, pots and pans, and clothing including Victoria's Secret, David's Bridal and Martha Stewart towels with tags. Total was about $5000. We've donated probably 1/3 of what we bought, value about $500 and tossed about 1/4, worthless. State law requires that return personal papers, photos etc. We have returned passports, birth certificates, credit cards and even the CREMATED REMAINS OF A 10-month old child. Did any of the owners really value their things, respect them, or want them? I don't think so. BTW we were warned about the Remains after we bought the unit - it was sad & creepy all at the same time. Just for the record, we have used storage units off and on (total 4 months) for the 5 years we've lived in FL - after Hurricane Charley and in between moves. It's been mainly for furniture & appliances, never for personal papers or food. If you have a minute to contact me that would be great. I just sent this link to all my friends so they can choose (or not) to do the math and take a good hard look at their own addiction...or forward to someone they know who has this addiction! This piece is a total "Keeper" and I don't need a storage unit to have it on hand! Redhawk, Compact member for 3 years and lovin it! I swear, it saved my life. I had the same problem, fortunately, I was set free the moment I discovered freecycle. I just could not dispose of things that were still good- still can't! but there are better solutions now, thanks to f.c., craigslist, kijiji, etc. When I was helping my sister move her things into a storage unit for one of her college summer breaks (several kids shared one small unit for the couple of months between semesters), we saw a rock band rehearsing in an otherwise empty unit nearby. We got a kick out of seeing how you could have a garage band without having a garage. When I was just entering high school, my mother moved me and my siblings to another state, and for some reason, she put all of our belongings in storage. We didn't have money to pay for rent, let alone a storage facility (yes, we were that poor), so it came as no surprise to me a couple of months later to find out my mom stopped paying the bill and all of our stuff had been auctioned off. She never told us our things were at risk, probably because she knew what our reaction would be. My entire childhood was lost in a single stroke. All of the belongings I'd treasured for years, gone. Things my father had bought for us for birthdays and holidays for over a decade, sold to the highest bidder. I was crushed. It was tragic. The memory of it is still bitter today, twenty years later. I wish I'd thought to go in person and appeal to the storage facility owners/managers, but I was too young to drive, and it was really long walk. Right on! I used to do pickups for a local non profit. A storage center called to donate what was in a trailer out back. That was where they put someones stuff before they got rid of it. The stuff was surprisingly OK for having been in the trailer for three plus years. No diamonds, but adequate for a resale store. Don't store, it costs you more. I always think of serial killers using them to stash heads and things. They creep me out. We rented one for a month when we had to stay with my parents for a month until our house was ready, and at one, the owner admitted they had a rat problem. Ugh. I assume you're referring to the hollowed out Art Deco Public Storage building at the Silverlake/101 exit as one of the less blighting storage facilities in the area, right? If so, it's actually ALWAYS been a storage facility of some kind, according to Los Angeles Magazine. But apparently there was once a speakeasy at the top! We used a self-storage unit temporarily for a move. We sold our house, moved to a new city, rented a teeny apartment and took 3 months to buy a new house. Self-storage was great. Other than that...I don't own anything that's worth paying $100 plus a month to store. Great post and a reminder that out of sight is often out of mind. The hardest thing to remember is the fact that you have all this stuff and when you're not looking at it regularly then you forget. I know we have cupboards in our current house that we never go into and given we're contemplating moving into a smaller house we're going to have to make a decisiion. DO WE REALLY NEED THIS!! I use my 5' x 10' slice of heaven to store my seasonal high bulk items like mountaineering gear, vintage audio equipment, munitions, and emergency food rations. Almost everything is in easy access bins lining the wall with a pathway in the middle, and everything is a fast grab when I need it and a quick dump when I'm done. I saw no reason to get rid of my good stuff just because I sold my home before the housing bust was approaching and my neighborhood was in rapid decline (lease option no money downers, pit-bull owners, and multiple residences of illegals w/ more than 8 cars parked in front of 2/3 homes each night). I am saving more than half of my mortgage payment, and the extra $100 for the elbow room and staging for Ebay auctions suits me fine. A larger apartment would be much more than an extra $1200 per year. I am surprised you are allowed to keep munitions in a public storage facility. Good points but not always relevant. We have lived in the same apartment in a major city for over 30 years. We also work from home and have a home office/library that takes up a huge part of our space, along with all the electronics, files, books, etc. that go along with it. We could NEVER afford office space in NYC these days. However, we can "space shift" and store off-season, financial and special stuff (displaced by the office stuff) in affordable storage. In a one-bedroom apartment, even basic stuff takes space. The "cost" of storage is worth it to have a space we can live in without feeling literally trapped by stuff. Sure, you can look at what we spend each month and say: Wow. I could use that for X...but we look at it and say: Wow, we've gained another whole room for a literal fraction of what it would cost a month to rent that space and/or live in a larger space. If you don't do anything, wear anything, collect anything and have a huge space--which is NOT most people in a city--you can get away without storage. But real people, including those of us who recycle, repurpose and give to Salvation army, sell on craigslist, still need space. Another use for storage spaces? Many people keep their small biz inventory in them. Some even try to run their biz from these spaces! Which you can do in the boondocks but not in the city. What we need is more of these spaces so the prices were more competitive. FYI: It makes no sense to rent space to compensate while you go from a huge home (3,000 square feet) to 1, 200. That's just delusional. As you noted, the real issue is NOT the storage space, but the psychological issues involved in hanging on to "stuff"-- your friend is trying to pretend she still has that lifestyle. Until she admits those days are over, she won't move on. It's easy for us to say: Get rid of it. But all those years, she's been in fear of what is inevitable. FYI: You have to be sensitive to people's belief and feelings on all of this. Being too tough does not help. Passing stuff on is important to people. And FYI: You do NOT know what her daughter will or won't value. I can tell you stories of families where one member decided on the death of a parent, for example, to get rid of stuff. Meanwhile, siblings became hysterical, enraged and so upset (because they did want the possessions for sentimental value) that family members literally stopped speaking to each other. This is a highly loaded issue. I agree, the article seems only to apply to people who live in houses or at best large apartments. For those of us who live in small cramped apartments/condos or share small living spaces with several family members, getting storage space may be the sensible or courteous thing to do. I have some drawings, paintings, and art supplies in a climate controlled storage unit that costs me $15 a month, hoping for the day I have an art studio where I can use them. I have a big enough apartment now that I could put them in here, but they are very messy. I won't give up on my future, so right now I consider it worth it. They've been in there a few years now. Old art school drawings can be valuable fodder for new paintings. You have made some excellent points and doing "the math" is absolutely key to helping people see the light on storing stuff they just can't part with. I apply the same math when walking people through their basements that have become nothing more than storage units. Many people are paying even higher annual rates (per square foot) in giving whole rooms over to stuff they don't use but don't want to let go of. There are, of course, times when the math for a storage unit does make sense. We live in a very small condo. We rent a storage unit that houses our off-season items (only during the offseason) my husbands tools (which he uses regularly) extra storage for tools I need for my business and our archived paper files (which we are legally obligated to keep). Essentially, this storage unit is the equivalent of our basement/garage since we don't have one. To purchase this extra 120 square feet of living space in our neighborhood would cost substantially more than the monthly fee on this storage unit. It's one example of when the math does make sense. Thanks for sharing your thoughts on this matter. Very informative. Thanks a lot. I never knew the prices of those storage. this article definitely makes me take a deeper look into the stuff i want to hang on to. It might be economically sound to donate or sell my items. You're making it sound like she's financially doomed for wanting to be a parent, subtly saying don't have kids - they will destroy you. Another attempt at undermining the family - the most crucial part of society. If it fails, the world also fails. There's a lot more goin on here that that, but the writer seems slanted this way. This is silly. I saw nothing like that in the article at all, it focused on the problem with having too much junk and spending lots of money to store it. You're reading things into the article that aren't there. I think blaming the storage companies for the irresponsible behaviour and habits of people is absurd. Sarah's "worst financial decision" was adopting a child in the first place while single and selling her house and not working in an attempt to be a stay-at-home mom on her own. That was her first problem, not putting her extra stuff in storage. I definitely see the author's point, but here's my story. My husband and I live in a 2 bedroom condo in a city (Chicago) with 2 kids. Much like a poster above, the storage fees for our 5'x5' unit are significantly cheaper than buying a bigger place with more storage space. We go to the storage unit reasonably regularly. The tricycle stays in the storage unit all winter, and the sled stays in it all summer. Older child's toys and clothing go into storage when she outgrows them and get taken back out when they are appropriate for our younger child. Once younger child outgrows them, they are sold, donated, or given away. My sister uses her Ocala self storage to store all her home decor she is not using while she lives with us and looks for her own home. I think there are certain reasons you should use storage and reasons you shouldn't. If you are just going to use it like a garbage can to throw unwanted items in than you should definitely just think of giving unneeded objects to charity or something like that. I agree with this article 100% and I own a storage facility! We have had dozens of tenants through the years, but 3 come to mind. Between the 3 of them, they have paid for 3 of my daughter's 4 years at a state college. One paid rent for 8 years then stopped paying rent and his belongings were sold for more than $11,000. The next one finally decided after 15 years that the stuff isn't worth anything and is donating most of it to the Salvation Army. The 3rd one is a couple who stored their stuff then moved across the country. He then left her with their 2 kids. She admits she struggles with her bills and we have offered to sell her belongings for her, yet she continues to believe that someday she'll be back to collect all of her "valuable" stuff. Most of our tenants use their space as an attic. If you aren't using it temporarily between moves, you probably have too many things! Storage units are generally not a good idea. However, comparing it to a drug problem is ludicrous. 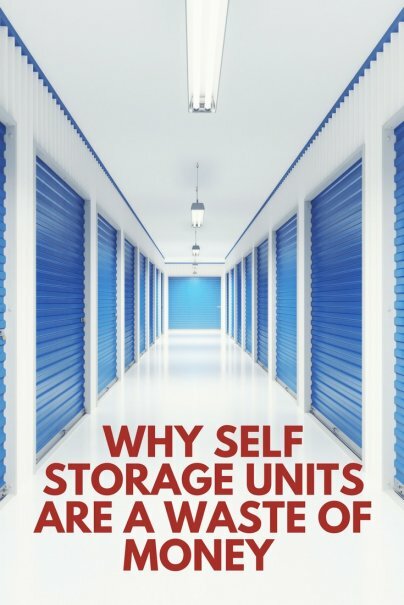 This is by far the best article I have read on self-storage. I have nothing in storage and I came to the article from your blog (where I was directed by Wise Bread) but I kept on reading because the way you described the situation was so gripping. I have nothing to add to the subject, but wanted to give kudos on the form. Very good article and you cover all the big points. My parents and I got a storage unit in '06 out of necessity. We needed to store almost a house worth of stuff during renovations. Problem is, not everything got put back into the house after the renovations. Over the past 7 years we have moved into smaller units while "thinning the herd" or junk. On average, we likely spent $200/mo or a total of $17,000 - enough to have bought a new car. Put in this perspective, I feel sick, but in a good way. It is better to take a blow to one's ego and realize nothing I held onto was worth this much, than to continue dumping money into a black hole. For me, storage was a necessity. I was going to sell my home and needed to move most of my stuff in order to get it listed and presentable. So I hauled a full 26 foot truck full to storage out of state where I would be moving. Came back and cleaned and organized the remaining things to list the house for sale. House was on the market for about 2 months and then another 3 weeks to close on it. Packed up the remaining stuff and hauled it to storage. Stayed at an extended stay hotel while looking for a home. Yes, I paid cash for the house. Moved my stuff out of storage and into the new house. Lots of work. But easy access while my stuff was stored. Moving companies will just hold your stuff hostage until you pay up. Your stuff may be in a warehouse on a different coast for all you know. If you use self storage for what it is meant for, temporary short term, it is great. I could get access to my stuff 24 hours a day/7days a week. Which I definitely needed. Most of my stuff was not junk, though everyone will have a brooms, dustpans, and other basic odds and ends, that seem silly to store. The big picture was the totality of what was in the house, not the miscellaneous items. Interesting article. However self storage came in handle when we needed to move my mom's stuff from her house (decorating) into storage. It can be a nightmare, so we found out just looking for quotes. We came across storing.com who claimed to do a complete service, collection, storage, delivery. Their prices where really good, so we gave them a shot. Turns out to be the best thing ever. If you can find companies doing this type of service, try it out. Saved us so much time and money. A stress free situation for my mom to when the driver and porter turned up. Are storage was for 6 months so it only cost her like £66.00 per month with a free collection. We just bailed an old man out of a $1400 per month storage bill that he'd been paying for FIFTEEN YEARS. 15 years! Almost a quarter million dollars, and most of it was empty boxes. We've done well based on what we paid, but the value isn't even close to what he paid to store it. Have a friend who put her late mothers contents of her home in storage because she wants to clean out her own home to add her mothers things into it. That was around 2007. It is still in storage, plus new things added. She is a hoarder who wont let anyone into her home. The amount each month is $350 ( on social security disability and works part time) since 2007. She also oawns and pays on jewelry for years. When she cant make ends meet she trys to borrow mo ey, including from me ( I am on disability ). She just chewed me out for not lending her $75 and said horrible things to me. The friendship is over. This I'm sure is why storage is a horrible idea.